NEIL McGee returned to competitive action at Convoy on Saturday as the Gaoth Dobhair man helped the Northwest to a facile Regional League win over a weakened Inishowen side. The appearance of the full-back, who came through his first full game since sustaining a broken toe, is sure to have heartened the watching county management team. 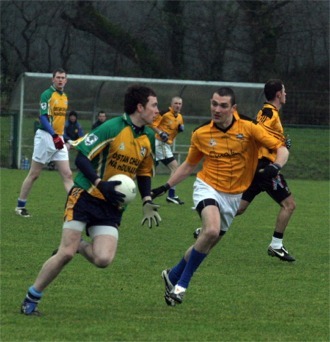 McGee has been sidelined since before Christmas, but returned to training with the county side last week. His Northwest team were totally in command in this one-sided affair on Saturday, when a pair of goals inside the first two minutes of the second-half had the win sewn up. Already six points up (0-9 to 0-3) after a domineering opening half, the North West outfit struck gold after the switch of ends with John Paul Gallagher and Michael Sweeney scoring the three pointers. In difficult weather conditions on the immaculate surface of Páirc Naomh Mhuire, the Northwest delivered a good exhibition of scoring, with Joe Friel's sublime 45-metre free out on the right sideline after three minutes setting the tone for the way forward. Trevor Alcorn, Stephen Coyle and Friel again all had eye-catching scores in part one, where the Inishowen response came only in the form of an Anthony Kelly free and scores from county panellist Odhran Doherty and Paddy Kelly. John Paul Gallagher of Cloughaneely, who had an industrious hour at the office, rolled the ball home under the body of Declan O'Donnell for the game’s first goal on 31 minutes and barely 30 seconds later the net was bulging again. This time, it was Fanad Gaels’ Michael Sweeney who profited from a gaping hole in the Inishowen rearguard to blast home from 20 metres. the dozen was still the distance, as Northwest motored to the top of the pile with two wins from their two outings. Inishowen will be hoping for better when they play the East tonight in Ballybofey. Throw-in is 7.30pm. NORTHWEST: Lee McFadden (Cloughaneely); Sean Maguire (Cloughaneely), Neil McGee (Gaoth Dobhair), Peter Witherow (St Michael’s); Danny McBride (Downings), Liam Paul Ferry (St Michael’s), Kevin Mulhern (Cloughaneely); Michael Sweeney (Fanad Gaels), Joe Friel (Cloughaneely); Stephen Coyle (Cloughaneely), Martin McElhinney (St Michael’s), James Carroll (Gaoth Dobhair); Trevor Alcorn (Termon), John Paul Gallagher (Cloughaneely), Christopher Bradley (Milford). Subs used: Noel Kelly (Gaoth Dobhair), Pauric Curley (Milford). INISHOWEN: Declan O’Donnell (Carndonagh); Kevin Coyle (Moville), Sean McDaid (Urris), Michael Nelson (Carndonagh); Martin Donaghey (Burt), Gerard Doherty (Carndonagh), Damien Harkin (Malin); Paddy Kelly (Malin), Ciaran Dowds (Burt); Kevin McDermott (Burt), Odhran Doherty (Buncrana), Martin Duffy (Muff); Sean Doherty (Urris), Anthony Kelly (Malin), Nigel McMonagle (Moville). Subs used: John Doherty (Buncrana), Cathal O'Kane (Carndonagh), Enda McColgan (Muff).